This easy meal in a pan can be assembled while the oven heats up, and leaves you with minimal dishwashing chores to boot. 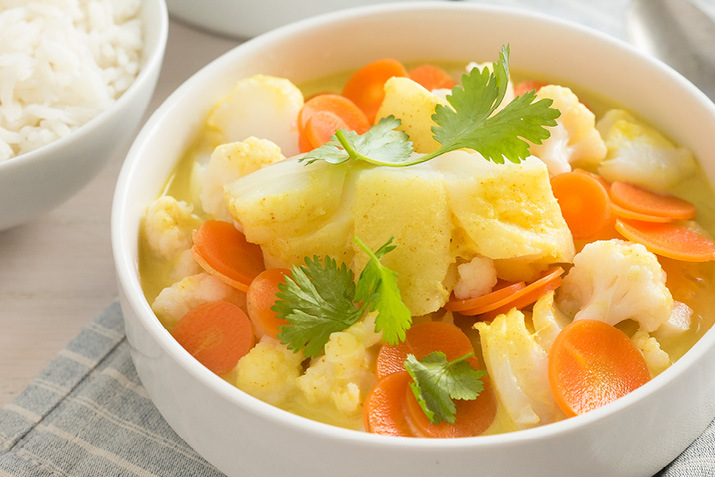 A can of coconut milk delivers enough complexity to create a curry sauce with no fuss, and it turns a plain piece of fish into an exciting meal. If your fish filets are thinner than one inch, check on doneness at 15 minutes. Heat the oven to 375⁰F, and set up a steamer for the vegetables. In a cup, mix the coconut milk, curry powder, cayenne to taste (if using), and salt. Steam the cauliflower and carrots for 2 minutes, then let cool. Place the fish in a 2-quart baking dish and cover with cauliflower and carrots, then pour over the sauce. Bake at 375⁰F for 20 minutes. When the fish is cooked through and flakes easily when pierced with a paring knife, serve. Serve this creamy curry atop or alongside your choice of rice, and add contrast with a crisp, cool lettuce salad.